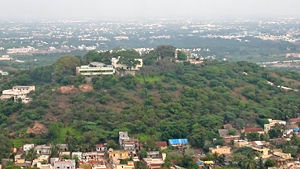 St. Thomas Mount is a small hillock located in Chennai, Tamil Nadu, India, near Guindy. The mount is known locally as "Peria Malai" (Big Mount—in Tamil language) or "Parangi Malai." Legend maintains that St. Thomas, one of the Twelve apostles of Christ, traveled to India after the crucifixion of Jesus, bringing the gospel to the people of India. St. Thomas Mount is the legendary place where Thomas had been martyred, shot by his assailants with a bow and arrow. He is thought to have clutched a stone cross, bleeding on it during his death. That cross has been called the bleeding cross, as miracles of its bleeding have been reported. The Portuguese built the shrine of Mother Mary, a small relic-filled Church, in 1523 at the summit of the 300 foot high St. Thomas Mount. The bleeding cross has been built into the altar wall. An oil painting of the Madonna, reputed to have been painted by the apostle Luke and brought to India by Thomas, is hung in the shrine. The Little Mount on St. Thomas Mount is reputed to have been the hermitage of St. Thomas, a humble cave in the hillside. Legend states that Thomas had been in the cave when assailed, escaping to the hill where he met his death. Acknowledging the importance of the holy site to the Roman Catholic Church, Pope John Paul II visited the pilgrimage site on February 5, 1986, during his visit to India. According to legend, St. Thomas had been one of the first Christians to reach India and to preach Christianity. He was believed to have reached South India in 52 C.E., spending the last years of his life in a cave on the hill. Tradition states that Thomas had been martyred in 72 C.E., shot by a bow and arrow. Over the centuries, the legend has been passed on, leading to the hill taking the name St. Thomas Mount. Mother Mary had been built in 1523 on top of the mount, a shrine dedicated to "Our Lady of Expectation." The altar stands on the spot believed where legend places St. Thomas martyrdom in 72 C.E. A gateway stands at the northern foot of the Mount with four impressive arches surmounted by a cross bearing the inscribed date 1547. A flight of 160 steps leads up to the summit of the Mount. Fourteen stations of the cross have been erected on the way to the summit. In 1547, an excavation unearthed a stone cross with old Sassanid Pahlavi inscriptions on it. The cross, reputed to have been chiseled by the Apostle himself, became known as the 'Bleeding Cross' as it has stains resembling blood stains which reappear even after being scrubbed off. The cross allegedly bleeds afresh periodically. It first "bled" publicly during Mass in 1558, the last recorded occasion took place in 1704. Father Guy Tachard, a Roman Catholic priest, witnessed the event, Vicar, Father Gasper Coelho passing on his testimony. St. Thomas supposedly clutched the cross in his dying last moments. When discovered, priests built the cross into the altar of the church along the wall where it has remained since. On either side of the chancel oil paintings depicting the twelve Apostles of Jesus Christ have been framed. Above the altar hangs an oil painting of The Madonna, considered one of the seven painted by St. Luke the Evangelist and brought to India by St. Thomas. That picture of the Madonna has been proclaimed the oldest Christian painting in India. The Catholic (Latin rite) diocese of Chingelpet ministers at the shrine administration. The church conducts The Festival of Our Lady of Expectation, celebrated on December 18th every year, in a grand manner. Saint Thomas day, celebrated on July 3, commemorates his martyrdom. During the Easter season, faithful climb the steps to the church, singing hymns and saying the "Way of the Cross" prayers. Petrus Woskan, an Armenian merchant, paved the way with granite steps to make the climbing easy. The same Armenian benefactor bestowed the oil paintings and beautifully carved Pulpit in the church. The convent of the "Holy Apostles Convent," managed by the priests of the Franciscan Missionaries of Mary (FMM) order, adjoins the church. A home for the physically and mentally challenged children, run by the nuns of the convent, stands attached to the convent. The Little Mount (locally known as the Chinnamalai—the small mount), is a rocky prominence where legend places the tiny cave that served as the Apostle's home. He led a spartan life, often praying on the top of the hill and preaching to the crowds. The rock-hewn cave, with its low, narrow opening, has an altar with the image of St. Thomas. To the east of the cave, an opening stands, supposedly that of a tunnel through which the Apostle fled from his assailants to St. Thomas Mount. The faithful believe that the opening (window) had been miraculously made and through that St. Thomas escaped from his enemies who waited in front of the entrance. Near the tunnel's entrance, a palm print displays impressed on the rock. The faithful believe that hand-print and the footprint at the foot of the hillock, to be those of St. Thomas. A church built by the Portuguese in 1551 C.E. on little Mount still stands. At the entrance, a portrait of St. Thomas with a Portuguese inscription hangs, while a masonry cross at the top of the hill marks the spot where St. Thomas customarily preached. St. Thomas Garrison Church The magnificent St. Thomas Garrison Church, built by the British in the 1880s, sits at the foot of the Mount. St. Thomas Sand St. Thomas Sand is the sand taken from the tomb of St. Thomas at Mylapore, in Chennai, India. The sand from the tomb, considered a relic of the Apostle, has been reputed by the faithful to have miraculous healing powers. Believers procure small quantities of sand and either carry it with them or keep it in their homes. The belief has a long history, Marco Polo mentioning the custom in his travel records. St. Thomas Postage Stamps In 1972, to commemorate the nineteenth centenary of the martyrdom, the Government of India Department of Post and Telegraphs released a postage stamp depicting the picture of the bleeding cross of St. Thomas Mount. Earlier, in 1964, the Post and Telegraph department of India had released a stamp depicting the Ortona silver bust of St. Thomas located in Italy. St. Thomas Mount Church altar where legend locates St. Thomas' martyrdom. Altar of St. Thomas Mount Church from further back in the sanctuary. ↑ Edward Gibbon, Henry Hart Milman, and Guizot, The History of the Decline and Fall of the Roman Empire (Philadelphia: Nottingham Society, 1880), 694-695. ↑ H. Hosten, Antiquities from San Thomé and Mylapore: The Traditional Site of the Martyrdom and Tomb of St. Thomas, the Apostle (Madras: Diocese of Mylapore, 1936). ↑ Lonely Planet Publications and Sarina Singh, India (Footscray, Vic: Lonely Planet, 2003), 694. ↑ Marco Polo, Henry Yule, Amy Frances Yule, and Henri Cordier, The Book of Ser Marco Polo, the Venetian, Concerning the Kingdoms and Marvels of the East (New Delhi: Munshiram Manoharlal Pub., 1993). Gibbon, Edward, Henry Hart Milman, and Guizot. 1880. The History of the Decline and Fall of the Roman Empire. Philadelphia: Nottingham Society. OCLC 7346817. Goodman, Martin. 2002. On Sacred Mountains. Loughborough: Heart of Albion. ISBN 9781872883588. Hosten, H. 1936. Antiquities from San Thomé and Mylapore, the Traditional Site of the Martyrdom and Tomb of St. Thomas, the Apostle. 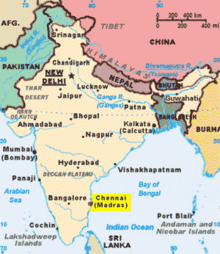 Madras: Diocese of Mylapore. Lonely Planet Publications and Sarina Singh. 2003. India. Footscray, Vic: Lonely Planet. ISBN 9781740594219. Polo, Marco, Henry Yule, Amy Frances Yule, and Henri Cordier. 1993. The Book of Ser Marco Polo, the Venetian, Concerning the Kingdoms and Marvels of the East. New Delhi: Munshiram Manoharlal Pub. ISBN 9788121506021. OCLC 2525456. Saint Thomas of Mylapur Catholic encyclopedia. Website of St. Thomas Basilica. 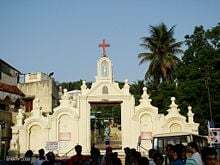 History of St. Thomas in India. University of Chicago photo library. History of "St. Thomas Mount"
This page was last modified on 19 October 2015, at 20:42.